The new touring Broadway musical, Come Fly Away, conceived, choreographed, and directed by Tony Award-winner Twyla Tharp and by special arrangement with the Frank Sinatra Family and Frank Sinatra Enterprises will open at the Adrienne Arsht Center for the Performing Arts of Miami-Dade County on March 20, 2012. Come Fly Away is the fourth show in the Broadway in Miami 2011-2012 subscription season, made possible with the generous support of Bank of America and presented by Florida Theatrical Association, Broadway Across America and the Adrienne Arsht Center. 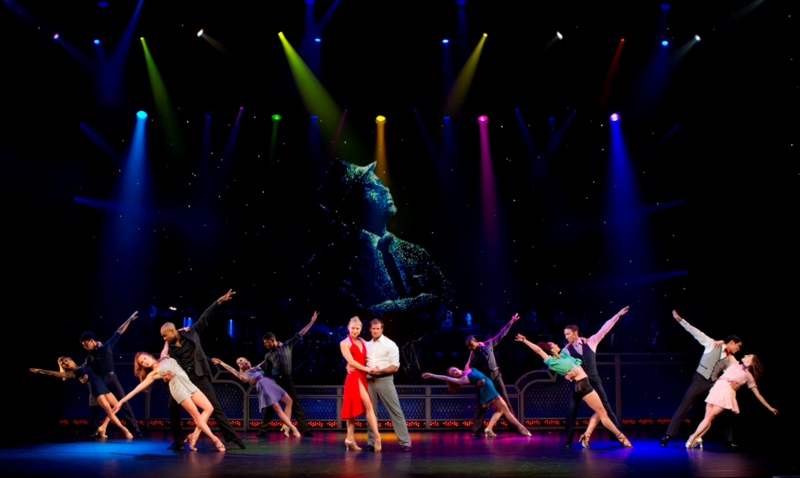 Come Fly Away is the musical valentine to the legend that is Frank Sinatra, fusing his unforgettable voice, with a sensational live band, 14 of the world’s finest dancers and the creative vision of Twyla Tharp into a spectacular tribute to Ol’ Blue Eyes. Come Fly Away follows four couples as they fall in and out of love during one song and dance filled evening at a crowded nightclub. The Broadway musical weaves an unparalleled hit parade of classics, including “Fly Me To The Moon,” “My Way,” and “That’s Life,” into a soaring musical fantasy of romance and seduction. The show’s score combines classic and newly discovered vocal performances from the Sinatra archives, along with Sinatra’s signature arrangements by Nelson Riddle, Billy May and Quincy Jones, among others, and brand new charts, for this fresh innovative musical. Come Fly Away, which premiered at the Alliance Theatre in Atlanta, GA in September 2009 and opened on Broadway in March 2010, is the next and most elaborate chapter in one of the most fruitful collaborations in contemporary dance. Twyla Tharp’s creative relationship with the music of Frank Sinatra began in 1976 with the premiere of Once More Frank, a duet created for the American Ballet Theatre, performed by Ms. Tharp and Mikhail Baryshnikov. The collaboration continued with Nine Sinatra Songs, Ms. Tharp’s acclaimed piece for fourteen dancers, which had its world premiere with Twyla Tharp Dance in 1982, and was followed by Sinatra Suite, a duet featuring Mr. Baryshnikov and Elaine Kudo, which had its world premiere in 1984 with American Ballet Theatre at the Kennedy Center. Mr. Sinatra requested that Sinatra Suite be performed when he received his Kennedy Center Honors Award, citing it as one of the purest expressions of his body of work. Tickets range from $25 to $82, and may be purchased through the Adrienne Arsht Center for Perfroming Arts box office. The Arsht is located at 1300 N. Biscayne Blvd., Miami, Florida, and houses the 2,400 seat Sanford and Dolores Ziff Ballet Opera House, as well as the 2,200 seat John S. and James L. Knight Concert Hall, and the 300 seat Carnival Studio Theater. For information, or to purchase tickets for the many diverse offering of the Adrienne Arsht Center for the Performing Arts of Miami-Dade County, you may contact them at 305-949-6722, or visit them online at www.arschtcenter.org. The Adrienne Arsht Center for the Performing Arts of Miami-Dade County is made possible by the public support of t he Miami-Dade County Major and the Board of County Commissioners, the Miami-Dade County Department of Cultural Affairs and the Cultural Affairs Council, and the Miami-Dade County Tourist Development Council. It also receives generous support from private and corporate contributions to the Performing Arts Center Foundation of Greater Miami through it’s Membership Program, the City of Miami Omni Community Redevelopment Agency, the Dade Community Foundation, The MAP-Fund, the Sate of Florida, the Department of State, the Division of Cultural Affairs, the Florida Arts Council, the National Endowment for the Arts, the Doris Duke Charitable Foundation, the Rockefeller Foundation, the Andy Warhol Foundation for the Visual Arts, and the John S. and James L. Knight Foundation.